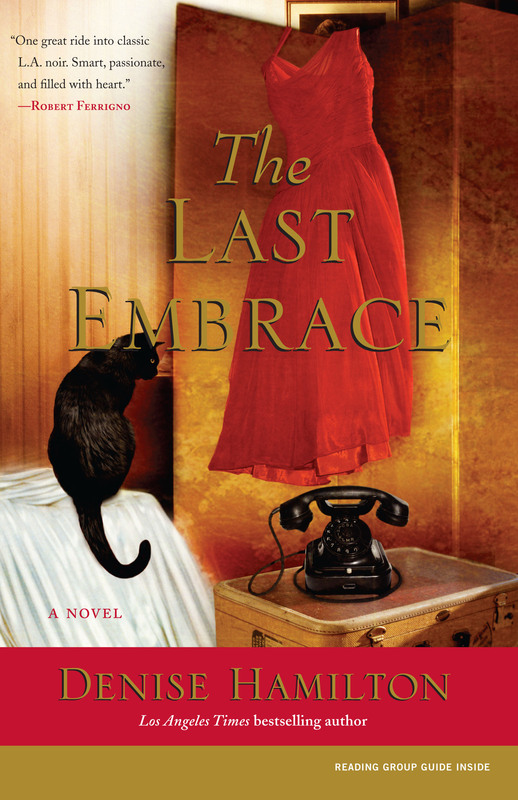 With vibrant characters and unerring insight into the desires and dark impulses that can flare between men and women, The Last Embrace showcases Denise Hamilton at the height of her storytelling powers as she transports readers to a fascinating, transitional time in one of America's most beguiling cities. When Lily Kessler, a spy for the OSS, returns from Europe to the United States she learns that her late fiancé's younger sister, Kitty has gone missing from her Hollywood boarding house. Lily heads to L.A. to put her investigative skills to good use. When Kitty's corpse turns up under the Hollywood sign, Lily sets out to unravel the mystery of the young starlet's disappearance and brutal murder. 1- Throughout the course of the book Lily, Harry, and Pico each take a serious interest in finding Kitty's killer and bringing him to justice. What motivates each character in his or her quest? What do each of these characters have riding on the investigation? Who is depending on them? 2- Though Kitty is the character whose life and death propels the action in the story, she is only actually a character in the first few moments of the narrative. By what means do we, along with Lily, fill in the blanks of Kitty's life in Hollywood? How did you, as a reader, decide which sources were trustworthy, and which warranted closer inspection? 3- How did actual, historical events and figures referred to in the novel help you relate to the characters and contextualize the story? 4- For many women, World War II opened doors professionally and personally that had only been open to men before the war; for many the barriers went back up when the war ended. Of this Lily says, "We're not helpless simpering creatures that have to be protected. We've held down jobs, traveled the world. Seen people die. Nobody's innocent anymore" (Page 67). In what ways has Lily's gender role been affected by the time she spent in Europe? Do any of the other female characters in the book strike you as feminist? How do you think they were affected by the war experience? 5- The narrator often refers to smells to help describe scenes and characters in the novel. The killer smells of black rubber; Kitty's room smelled like "newsprint, cigarettes, talc, and stale perfume" (Page 24). Why do you think Denise Hamilton took pains to include such vivid descriptions of scent? How is scent tied to memory? 6- Though the narrator throughout the book remains third person, the point of view shifts among many of the characters, and the narrator is never completely omniscient. How did this affect your reading of the story? Did you think this lent the narrative further mystery? Was it helpful to see the story from several standpoints? 7- Like every good mystery writer, Hamilton sets up circumstances that would support the reader being suspicious of just about anyone. Which leads did you find most compelling? Who did you think had the most motivation to kill Kitty? How did your suspicions change when more girls turned up dead under the Hollywood sign? 8- On page 197 Pico thinks of Lily as, "Feminine. And yet so hard. Like a steel blade wrapped in crushed velvet." How is this metaphor suited to Lily? How does she use her OSS skills to help solve Kitty's murder? Can you think of an apt metaphor for any other characters in the story? 9- When Pico and Lily are first getting to know one another he says, "Maybe home's not a physical place, but something we make in our heart and carry around with us" (Pg 165). Do you think that this applies to Lily? What become "home" for others in the novel? In what ways do Pico and Lily come to represent home for each other? 10. Hamilton takes us behind the scenes of Hollywood's Golden Age, exploring the secretive world of stop-motion animation and its technical whizzes. How did Max Vranizan's obsessions and eccentricities make him both a genius and a legitimate suspect in Kitty Hayden's murder? What did you learn about Hollywood special effects and its practitioners? 2- The Last Embrace recalls Noir films popular in the 1930s and 40s. If you enjoyed this novel, why not watch a DVD of a noir classic? 3- Listen to some of the music that was popular during 1949, the year when The Last Embrace is set. * indicates a song mentioned in the novel. Denise Hamilton is a writer-journalist whose work has appeared in the Los Angeles Times, Cosmopolitan, and The New York Times and is the author of five acclaimed Eve Diamond crime novels, Prisoner of Memory, Savage Garden, Last Lullaby, Sugar Skull, and The Jasmine Trade, all of which have been Los Angeles Times bestsellers. She is also the editor of and a contributor to the short story anthology Los Angeles Noir, winner of the Southern California Independent Booksellers Association Award for Best Mystery of 2007. She lives in Los Angeles with her husband and two young children. Visit her at www.denisehamilton.com.